Based on my past posts you should now know that sleep is precious to me and I take it very seriously. That is one of the reasons why I have a “no pets sleep with humans” policy (my mom is laughing out loud reading this). Riggins was pretty cool with this rule at one time and would even deny me his cuddling those early mornings I tried to make him come up into bed with me. The only time he really spent the night in the human bed with me is when he was sick or I was sick. Such a sweetie. Then his b-day came and I made the grand decision that his giant ball mush bed was bad for his back (he is after all 5 now) and a flatter more orthopedic friendly bed would be the perfect gift. When the bed showed up I was happy with how comfy it looked but concerned with the lack of headrest (Riggins likes his pillow). I’ve tried many pillow options but to this day haven’t found an acceptable solution. The dramatic b-day bed change seems to have thrown Riggins for a loop and he decided my bed was where he wanted to be. * Usually when I go to bed I spend some time reading my book. It is during this 1/2 hr – hr that Riggins slowly stalks around and around the bed looking for his open chance to jump in. When he gets to the point right before a jump I command, “go to bed”. His response is to sulk off and try again in a bit. * Riggins gives up his efforts about the same time I’m ready to turn off the reading light and get some shut eye. He knows now is not the time to make his move and instead pretends he is in a deep slumber. 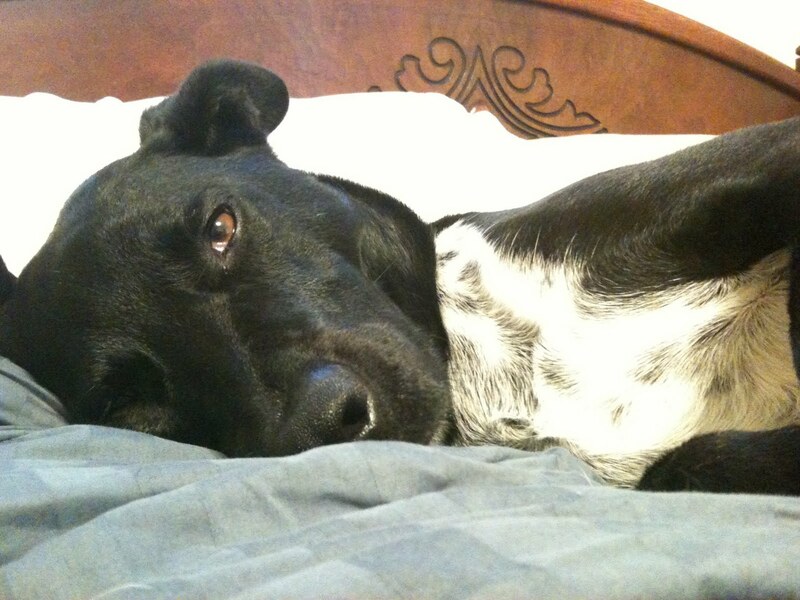 * From his bed Riggins monitors my REM sleep. Waiting for the moment when I will be off my guard. * Super early morning I’m in a deep slumber and he makes his move. He slowly gets up and tip toes to the bed. In one effortless jump he lands on top and freezes. Giving the bed time to settle with his weight and to verify that I haven’t been disturbed by his super sneaky actions. He then slowly lowers himself down. Not his favorite position but it will do for now. He has made it to the bed undetected. * As I drift back to sleep again he knows he has me. I can’t fight him. I’m too groggy and sleepy and out of it. He takes advantage to make himself comfortable. He would prefer if all the humans and animals he loved slept on that bed together in one giant pack pile. Since he can’t have that he is going to make sure his tiny pack of Wendy/Riggins is as close as it can be. This means he has to find a way to be touching me. You would think that he would put his head on my ankles or something as non-obstructive. You’d be wrong. * Riggins does his circle, circle flop (that circle thing dogs do before they lay down in a comfy position except instead of carefully laying down Riggins has a very dramatic flop he inserts at the end). The flop is designed to land 1/2 his body on top of mine so that it can slowly slip down my side and he can do it again, and again, and again. This position also demands a pillow be under his head. He is, after all, wanting to be comfy. * Minutes before my alarm goes off Riggins carefully inches himself away from me to curl up in a ball at a safe distance hoping that I didn’t notice the shenanigans that happened all night so he can do it again tomorrow. He knows how to sneak into those cracks and hit you when you are most venerable. He would give 007 a run for his money! Circle, circle flop! That so describes it! Circle, circle flop…and fun to say!